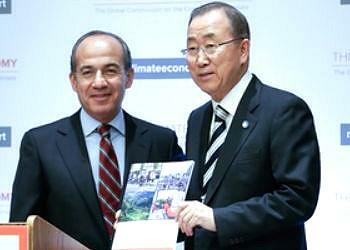 NEW YORK, New York, September 17, 2014 (ENS) – Lower carbon emissions and strong economic growth are both possible due to structural and technological changes in the world economy, finds a new report by a commission of global leaders chaired by former President of Mexico economist Felipe Calderón. Issued Monday, the report comes a week before world leaders gather for a climate summit at the United Nations hosted by Secretary-General Ban Ki-moon. At the summit more than 120 Heads of State and Government are expected to offer new carbon pricing plans and generate political will toward a meaningful universal climate agreement in 2015. “Yes, it is possible to have better growth and better climate. Yes, it is possible to create jobs and reduce poverty and at the same time reduce the carbon emissions that threaten our future. Yes, it is possible, but we need to make some fundamental changes and smart choices,” Calderón told reporters at UN Headquarters at a news conference launching the “Better Growth, Better Climate: the New Climate Economy” report. Calderón said the new data in the report of the Global Commission on the Economy and Climate shows that the world does not have to choose between fighting climate change and growing the world’s economy. “The transition to a low carbon economy can improve the quality of growth, including the creation of new jobs, cleaner area and better health. A growing number of businesses, cities and countries are showing us it is indeed possible,” said Calderón. The Commission’s Economy and Climate report sets out a detailed 10-point Global Action Plan for achieving prosperity and a safer climate at the same time. The Commission calculates that if fully implemented its recommendations could achieve up to 90 percent of the emissions reductions needed by 2030 to avoid climate change. But this would require decisive and early action by economic decision-makers. “Today we are giving $600 billion in subsidies for fossil fuels, but only $100 billion in support of clean energy every year. We are paying to pollute. That cannot continue,” urged Calderón. Chaired by Calderón, the Global Commission on the Economy and Climate, includes 24 leaders from government, business, finance and economics in 19 countries. The year-long study was conducted by research institutes from Brazil, China, Ethiopia, India, South Korea, the United Kingdom and United States and advised by a panel of economists. UN Secretary-General Ban told reporters that greenhouse gas emissions are at record levels and the effects of climate change are not only widespread, they are costly and consequential. “Scientists have long warned of the potential implications of climate change for economic growth. We can no longer afford to burn our way to prosperity. We must manage climate risk for sustained – and sustainable – economic progress. We need a structural transformation in the global economy,” Ban said. The UN chief said he looks forward to next week’s climate summit, where leaders from government, business, finance and civil society are expected to deliberate challenges and deliver recommendations on how to promote low-carbon growth. “I expect the Summit to deliver on four of the most prominent recommendations in this report. 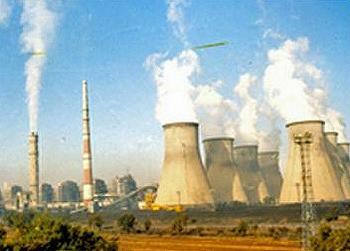 They are crucial to addressing climate change and promoting low-carbon growth,” Ban said. “These four recommendations – and the broader messages in this report – are not just climate-relevant. They are central to sustainable development and the post-2015 development agenda. We cannot eradicate extreme poverty without fighting climate change,” said Ban. Over the next 15 years, about $90 trillion will be invested in infrastructure in the world’s cities, agriculture and energy systems, “an unprecedented opportunity to drive investment in low-carbon growth and bring multiple benefits including jobs,” the Commission finds. Strong growth with lower emissions will happen in three key sectors of the global economy – cities, land use and energy. Building better connected, more compact cities based on mass public transport can save over $3 trillion in investment costs over the next 15 years. Restoring just 12 percent of the world’s degraded lands can feed another 200 million people and raise farmers’ incomes by $40 billion a year. As the price of solar and wind power falls dramatically, over half of new electricity generation over the next 15 years is likely to be from renewable energy, reducing dependence on highly polluting coal. Consistent government policy signals are essential for businesses and investors to create low-carbon jobs and growth. By establishing a level playing field through an international climate agreement, Governments can unlock investment and innovation, states the report.